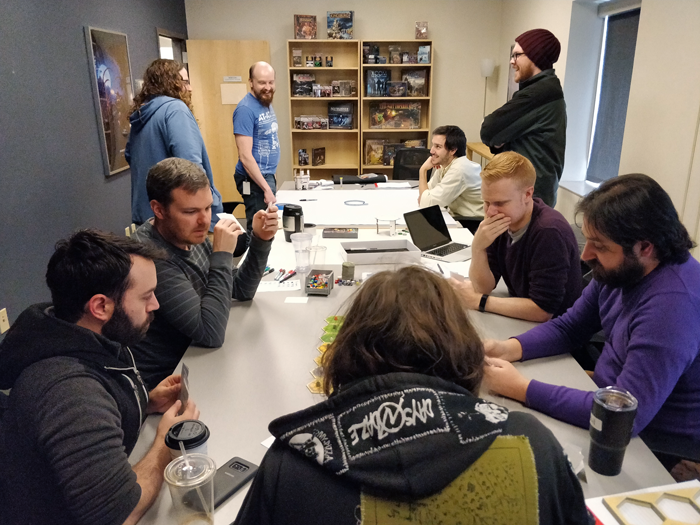 Recently, the entire Fantasy Flight Games studio came together for our very first game jam—a concentrated dose of creativity and teamwork, spread over just a few hours. 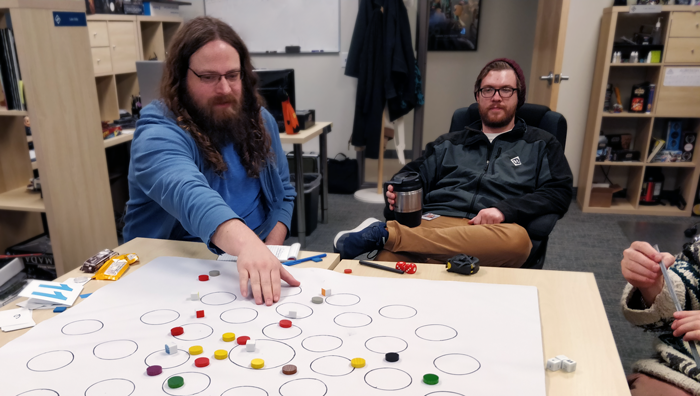 Today, to offer you a look at just what happened during our game jam, here’s one of the organizers, Board and Card Game Manager Andrew Fischer! I’ve always loved game jams. I’ve participated in the Global Game Jam each year and have sent in a couple submissions to Ludum Dare over the years. Every time I’ve participated, I not only had fun, but I felt like I grew and learned more in that two-day period than I do in an average month. A game jam is kind of like a 48-hour film festival. People break into teams, get some kind of prompt to build off of, and create a game in a (very) limited amount of time. Jams can be intense. They require creativity, teamwork, flexibility, and hustle, all with the clock ticking away. But they can also be very rewarding and fun. They allow people to take risks and try out ideas that they might not be able to in their day-to-day game development. I was inspired by my time in these other jams. On top of that, I’d seen the benefits that studios had gained from internal game jams (such as Double Fine’s Amnesia Fortnight), and felt that FFG could really benefit from a similar event. As luck would have it, Corey Konieczka had been thinking over a very similar idea. 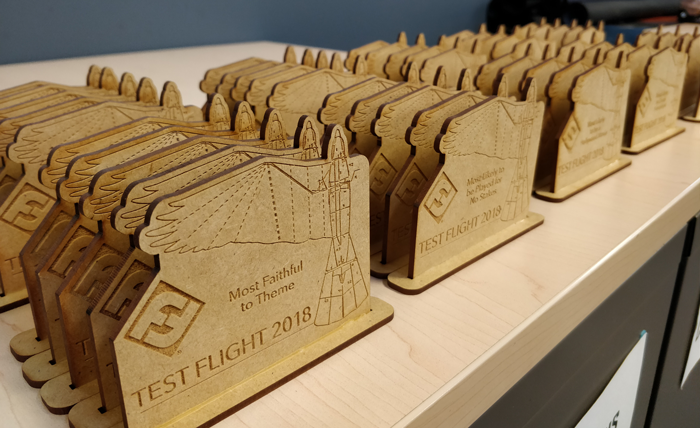 Together with senior designer Nate French and our Head of Studio Andrew Navaro, we worked to organize FFG’s first ever studio-wide game jam—which we called “Test Flight.” In today’s designer journal, I want to give you all a brief glimpse into this event and how we ran it! Most of the other game jams I looked to for inspiration were to create digital games, so I had to break some new ground in how to run the event for a tabletop-centric company. One of the first big differences was time frame. Tabletop games are (in most cases) much faster to prototype and test than digital ones. I wanted to keep a strong sense of time pressure on the event, so I decided to shorten the timeframe relative to most game jams, giving each group of four or five people only about sixteen hours (two days of work time) to brainstorm, develop, and test their games. But these were just recommendations, and teams were free to follow their own process. Some had something on the table within twenty minutes, while others took their time doing high-concept brainstorming for several hours. In the end, the sixteen-hour timeframe ended up being nearly perfect, keeping the pressure on while giving enough time to have a finished and tested deliverable. I was incredibly excited and humbled to see the creative ideas my coworkers put together in such a short amount of time. The games that scored to the most extreme on each spectrum earned an award! This encouraged participants toward pushing their ideas further instead of spending time polishing their production values just to edge out the competition. The silliness of the awards worked really well, but in the future, we’ll probably do fewer of them to make them feel a bit more exclusive. In the end, Test Flight was a big success! 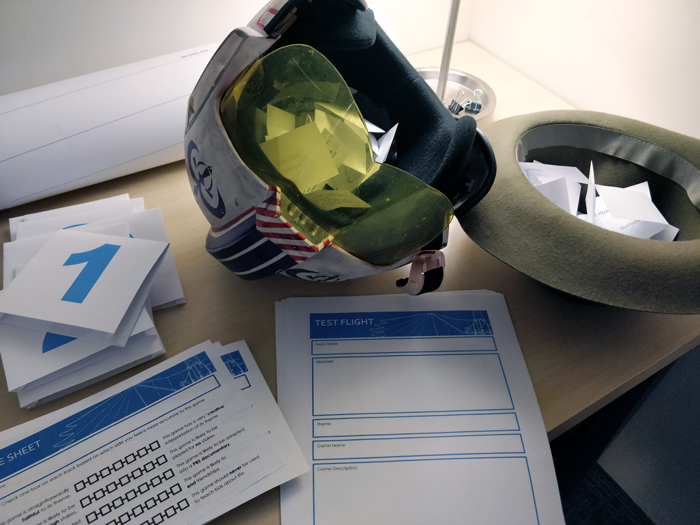 Across just two work days, we created thirteen unique, creative prototypes. People got a chance to work closely with coworkers from teams they rarely interact with, and brainstormed ideas that I’m sure will influence their designs to come. To other game creators out there, both hobby and professional: I strongly encourage you to check out a game jam. Whether you attend a publicly-available event, or hold one at your development studio, I think you will find the creativity, teamwork, and ideas you build at the event endlessly valuable. I know that I have. Go behind the scenes at Fantasy Flight Games with our Designer Journals, each offering a unique insight on game design or your favorite game!